Veliky Ustyug is a province (uezd) of the Vologda government (guberniya), Russia. Original Russian writing – Великий Устюгъ, German – Weliki Ustjug, English – Veliky Ustyug. 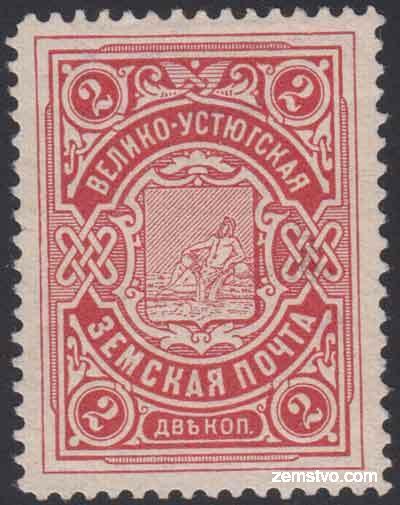 The postage stamp was issued in 1903-1907 years (few printing orders) by Saint-Petersburg’s the Expedition of Storing State Papers (Экспедиция заготовления государственных бумаг or ЭЗГБ). Ardatov type design. The total print run was 7685 sheets containing 192,125 stamps (5×5 sheets). The rectangular (52×27 mm) violet calendar zemstvo postmark. Y. Rudnikov. Veliky Ustyug Zemstvo Post (in Russian).